We love mini MIDI keyboards. The sleek, compact feel of the keys and the way it ultimately fits into my studio and stage setup makes me feel more organized. Akai Professional has done such a good job year in and year out with their music equipment, particularly their MIDI keyboards. I’ve had my MPK for about 4 years now and couldn’t be happier (I’ve upgraded this year). With that being said, their compact keyboards are built so well with such a low price, they’ve been dominating the mini game for quite some time. 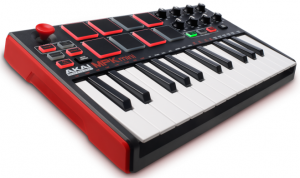 We saw a lot of positive reviews on the original Akai MPK Mini MIDI keyboard, so let’s see what they’ve done with their beloved compact controller with their new MkII models. Using a 25-key compact MIDI keyboard can take some getting used to and it’s hard at times using two hands. Aside from that, the 4-way thumbstick is great to get some custom and significantly swingy, more natural sounding pitch and modulation down to your tracks. 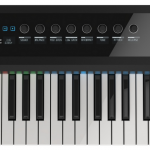 The 8 pads are more than enough for a mini keyboard…most popular full-sized have 12 to 16. The 8 Q-Link knobs are also stable in terms of mapping with your programs and the arpeggiatoris relatively standard, not too crazy as I recommend using a VST or program instead. 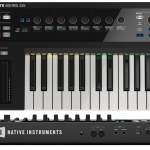 All in all this compact MIDI keyboard packs the necessary functions (and even a little extra with the sustain pedal input and octave options) for a mini MIDI keyboard, one we think is definitely well worth it in terms of price and overall capabilities. Akai has been creating music gear for 30+ years and know how important it is to make a reliable piece of music equipment. 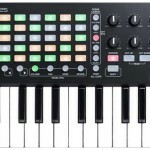 Their MIDI keyboards are very solid in terms of overall build and stability. The Mini MkII is built very well, especially because of the portability and potential travel purposes a lot of musicians will be using it for. 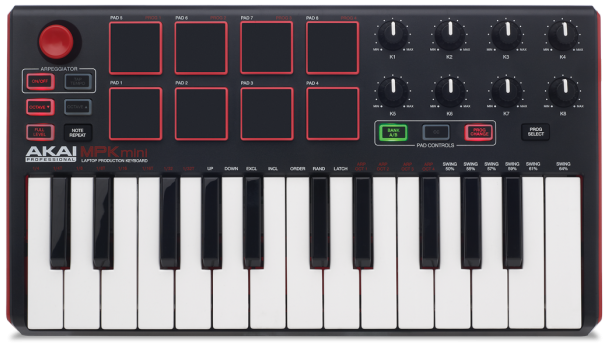 It isn’t even close to as bulky as the MPK225 keyboard, but it’s called a ‘compact’ MIDI controller for a reason. Our advise is to travel carefully — don’t pack a bunch of things on top of it or throw it around; however, it’s got a solid built made of material that isn’t flimsy or cheap. It won’t easily break on you but then again, don’t throw it around like a pillow. The pad quality is relatively standard, which is actually a good thing. We’ve heard so many nit-picky comments about pad controllers out there, especially with how many controllers are starting to surface around the market. These are great for what you pay for. Not as necessarily ‘MPCesque’ as their thousand dollar sample machines, but for a mini compact keyboard this is great. The keys are also feasible, just remember they are ‘mini’ keys, so they’re smaller than the average full-size on most MIDI keyboards (and obviously pianos). It takes a bit getting used to if you haven’t used a compact keyboard before, but once you become accustomed to it you get the hang of it. I had a hard time jamming at first but it took me about 4-5 hours to really get it down. Now it is smooth sailing. 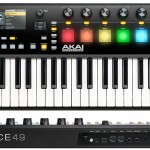 The Akai Mini MkII keyboard is great for using with most DAWs out there – and we’d hope so, being the trend nowadays is moving more and more towards a computer setup. Popular programs work just fine with this, especially Ableton Live, Logic Pro, Cubase, Reason, and Pro Tools. You’ll have to do some configuring in your software, so if you haven’t learned to do so it will take some time to get accustomed to the whole process. As soon as you learn, however, it becomes very easy to incorporating mapping with the MkII mini in your workflow. We really don’t ever mind extra VST’s or programs to add to our disposal, especially if it comes with a product that’s around $100. These are digital-based and you get a serial with the package once it arrives. In our opinion this is just as convenient as a CD. Here’s what you get with the Mini MkII: Akai Pro MPC Essentials, SONiVOX Wobble, and Air Music Tech Hybrid 3 synth. We’d say the software package is actually overboard in terms of pricing. Even if they added just one VST I’d be happy, but both Wobble and Hybrid 3 are pretty top-notch. I would’ve liked to see Ableton Live Lite added to the package as they have done with other keyboards, but their MPC Essentials will do. It’s a decent program in terms of DAW standalone but I wouldn’t use it in terms of a long-term solution. A nice plus, however. This is a solid compact MIDI keyboard that’s only $100. It’s one of our favorites out there and the original MPK mini was a hit, let alone this one only improves it with some minor tweaks here and there. People have complained about the lack of huge improvements, but why should Akai change what isn’t broken? We love the new look and think it’ll accommodate studios really well. The pad and key quality are feasible for pretty much all artists out there and the software that comes with it only adds to the overall value of the package as a whole. 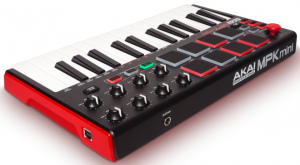 If you’re looking to invest in a compact MIDI controller, this one is definitely recommended (remember that the keys are mini as well — takes some getting used to). If we were to choose a real competitor, we’d go with the Novation Launchkey Mini (starts at $100 as well). You can read our review on the Launchkey Mini for more information. 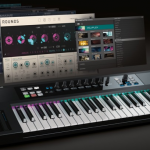 This definitely comes close and it’s a matter of preference, differentiating the software bundles for each package (the Launchkey comes with Ableton Live Lite and a lot of samples), and lastly brand loyalty. The Launchkey also has more pads (16 if that’s what you really want), but the Mini MkII one-ups it with the new thumbstick and sustain pedal, as well as a generally better build. 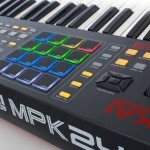 Try our top 10 best MIDI keyboards article for more choices. In the end, we love both Novation and Akai but if we were to choose, the new Akai Mini MkII MIDI keyboard is one of our favorites and a must have if you’re looking for a compact alternative. Check the prices on Amazon US or Amazon UK for the best deals we’ve seen on the net. Let us know what you think once you grab yours!